FAQs / How can I use Order Identification Number to track orders instead of Order#? At EZRentOut, we try to make things easy for you by providing you with default templates and frameworks to keep things organized. This is why we’ve given you the Order# to help you keep tabs on Orders easily. However, if your workflow primarily uses Order Identification Numbers (OIN) to keep track of orders, you can always use them instead of the Order# in Order listings. This can be changed from Company Settings → Advanced Settings → Order Identifier. Please note, for the OINs to be enabled, you’ll need to store Identification Numbers to all your Orders separately. You can edit an identification number for an order from its details page (see image below). By default, EZRentOut assigns an Order# for every Order that you create in your account. The first Order that gets added is #1, the second is #2, and so on. It’s all sequential. We’ve also designed a special field Identification Number for businesses who have their own sequence numbers. This is if you haven’t enabled ‘Use Order Identification Number (OIN)’ under Company Settings → Advanced Settings → Order Identifier. The image below shows the difference between both the settings for Order Identifier. 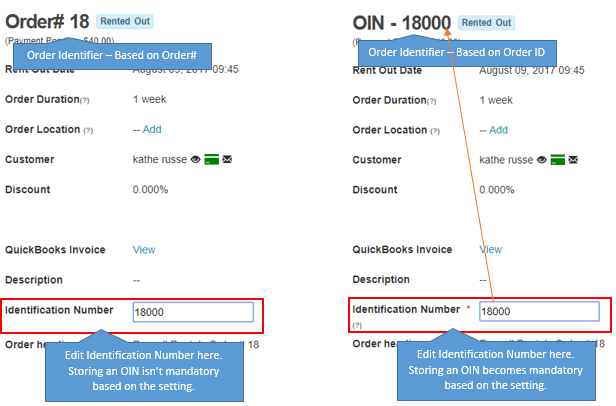 With Order Identification Number (OIN) enabled as your Order Identifier, when you create a new order, the system assigns a unique OIN (based on the Orders sequence number) to it automatically. Say, next order in sequence was 20, so the OIN assigned by the system will be OIN – 20. However, you can edit the OIN for this order from its details page as per your business standards for Identification Numbers. Based on this setting, an identification number cannot be empty. – OINs are unique for every order. – You can type in an OIN in the Search Bar to go directly to the details of the relevant order and take the necessary actions. We’ll explain the search workflow later in this post. – Orders are also referenced by the OIN in all alert emails. OIN link placeholder can also be added to customizable order email alerts. – If you have more than one serial number to refer to an order, you can always add a custom field of type ‘Text’ (More → Custom Fields). These custom fields also appear in the search results. You will view Order Identifier on Order listing page based on the setting you choose in Company Settings → Advanced Settings → Order Identifier. If Order# is enabled, you’ll see Order# as your primary column by default on the order listing page. Here, the table can also be customized using the 3 vertical dots on top right corner of the table. If you keep track of your Order’s identification number, a column for OIN can be customized here. Similarly, if Order Identification Number (OIN) is enabled, you’ll see OIN as your primary column by default on the order listing page and vice versa. Similar to the Order listing page view, the search functionality also plays out based on the setting you choose in Company Settings → Advanced Settings → Order Identifier. If Order# is enabled, searching by Order# from the main search bar, say 19, then ?19 will take you directly to the Order# 19. Please note, you need to type at least 3 characters keyword to search. To go to a specific order, type ? followed by the Order#, i.e. ?19. 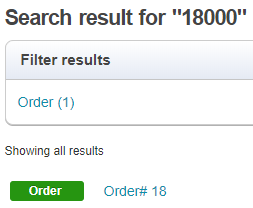 If Order# is enabled, searching by OIN from the main search bar, say 18000, will filter out your results this way. Similarly, if OIN is enabled, searching by Order Identification Number, say 18000, then @18000 will take you directly to the OIN – 18000. Please note, you need to type at least 3 characters keyword to search. To go to a specific order, type @ followed by the Order Identification Number, i.e. @18000. 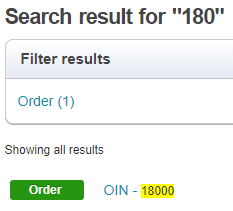 If OIN is enabled, searching by Order# from the main search bar, say 180, will filter out your results this way. Additionally, you can also add items, say to a work order (and where ever orders can be searched) based on the Order Identifier setting. On the search field, when you type a keyword or OIN or #/@, all orders with OIN assigned will appear, if OIN is enabled as the Order Identifier. 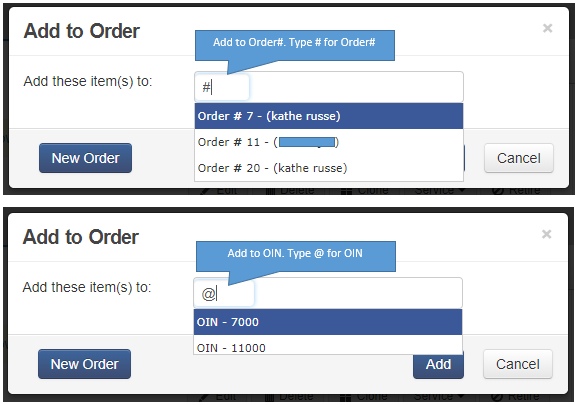 If Order# is enabled as the Order Identifier, all orders with Order# assigned will appear when you type #/@ or Order#. For work orders, associate it with Orders for the above search function to work.